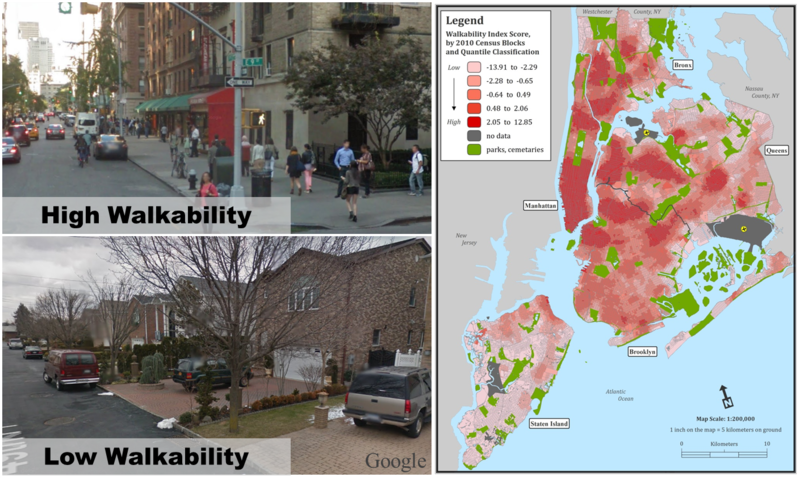 We just published a paper in the American Journal of Preventive Medicine showing that differences in residential neighborhood walkability in New York City (NYC) are associated with how residents utilize neighborhood space and are associated with total weekly physical activity. 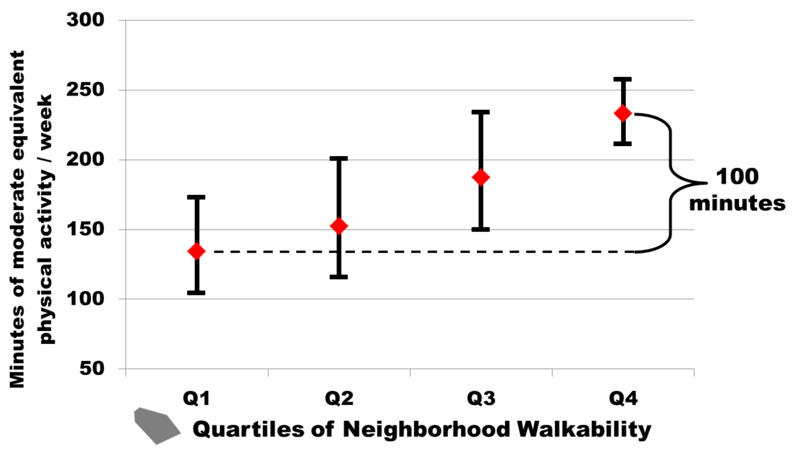 Higher neighborhood walkability was associated with significantly more physical activity and differences in activity attributable to variation in urban design were substantial when compared to the recommended goal of achieving 150 minutes of moderate intensity physical activity per week. The research was conducted in collaboration with researchers from the NYC Department of Health and Mental Hygiene and analyzed Global Positioning System (GPS) and physical activity data from the Physical Activity and Transit Survey (PAT). For a period of a week, PAT study participants wore an accelerometer to continuously measure physical activity and a GPS logger that recorded the participant’s location multiple times per minute. In all, the PAT Survey collected over 8 million GPS location readings, known as waypoints, as the study participants (n=803) went about their daily lives. Four illustrative examples showing how GPS logging data can be used to characterize which parts, and how much, of someone’s residential neighborhood is actually utilized by the person. The circle represents all neighborhood space within 1Km of a residence and the white area reflects a minimal convex polygon that encompasses GPS waypoints. They grey area represents space within 1Km of the residence that was not utilized. To identify how much area within their residential neighborhood participants utilized during the monitoring period, we defined a minimally convex polygon around GPS waypoints falling within 1Km of each participant’s home. This 1Km circular area around the home has commonly been used in prior research to define study participant’s residential neighborhoods. The use of convex polygons around GPS waypoints to define the utilized residential area is similar to methods used in wildlife studies to define the home territory of animals. In NYC we see that residents vary considerably in how much of the total 1Km circular residential neighborhood area they actually use as judged by the area encompassed by the GPS data. The walkability of entire 1Km cicular area around the home, the area within the polygon (utilized space) and the area within 1Km of the home that was not included in the polygon (non-utilized residential neighborhood space) was measured using the NYC Neighborhood Walkability Index (NWI) [See more on this measure Here and Here]. The NWI includes measures of residential density, land use, street connectivity and access to subway transit and was adapted from earlier work by Lawrence Frank and colleagues. Comparisons of mean NWI scores for the areas of the residential neighborhood utilized by study participants and areas not utilized found that NWI scores were significantly higher in utilized as compared to non-utilized areas. 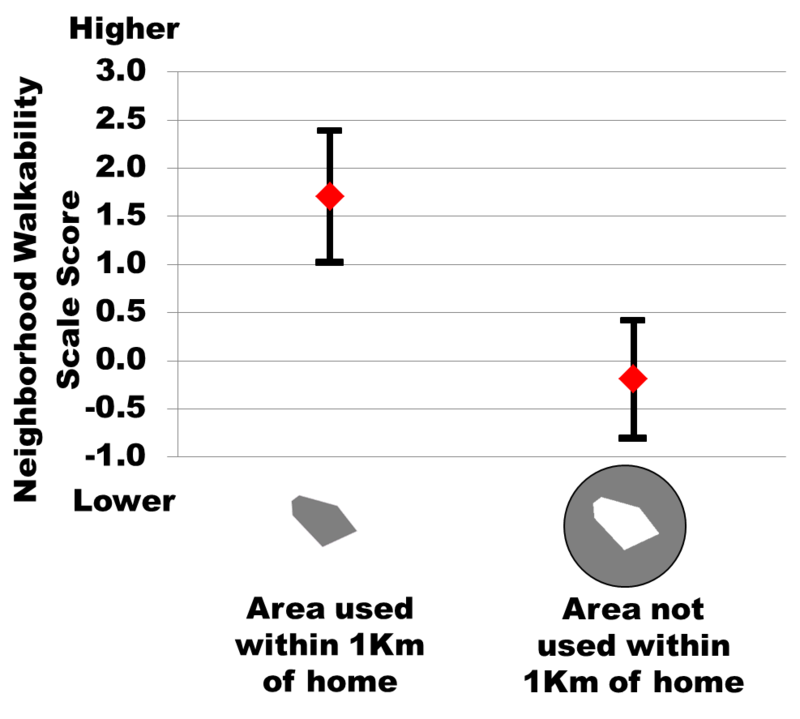 This difference suggests that study participants systematically used the most walkable areas of their total accessible residential neighborhoods (defined as 1Km around the home). Mean NWI scores (and 95 % confidence intervals) in residential neighborhood areas utilized and not utilized by study participants. The accelerometer data were used to measure total minutes of moderate and vigorous intensity physical activity engaged in over the week study period. Since vigorous activity requires roughly twice the energy expenditure of moderate intensity activity, minutes of vigorous activity were weighted by two and added to minutes of moderate intensity activity to compute minutes of moderate intensity equivalent physical activity. This measure is useful for comparing study participant’s engagement in physical activity to current health based recommendations for activity. Analyses of participants NWI scores and physical activity showed that after adjusting for numerous covariates, higher residential NWI scores were associated with significantly more total weekly physical activity. Compared to participants living in neighborhoods in the lowest quartile of NWI score, participants living in neighborhoods in the highest quartile of NWI score engaged in 100 more minutes of moderate intensity equivalent physical activity per week. Considering that the current recommendations are that an adult achieve 150 minutes of moderate intensity activity per week, the differences we observe are substantial. Covariate adjusted mean (and 95% CI) minutes of moderate equivalent physical activity per week by quartile of residential neighborhood NWI score. This entry was posted in Accelerometers, GPS, Physical Activity, Walkability. Bookmark the permalink.